(Chandelier shown on riser for illustration purposes only, must be ordered separately) Create amazing floral designs for parties, weddings and other special events. You can use them to build HUGE displays, and even risers for our chandeliers and more! Add an interesting twist by filling the columns with candy, marbles, colored water (you'll need to seal with waterproof clear glue if you use liquid), or our famous jelly Decor. The finish is PERFECTLY clear with no blue cast, as cheaper versions may have. 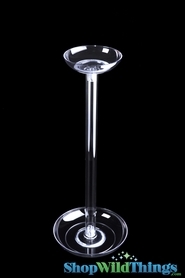 Our Lomey Design System Columns come with One Clear Lomey 6" Dish (top), One Clear Lomey 9" Dish (base) and 2 Lomey Design Universal Pieces (3 5/8" Diameter) included, which are the "end caps" to attach to each end of the column. This is what holds it upright and provides a flat anchor on top. For heavy displays, glue the base to the floral dish or plate. 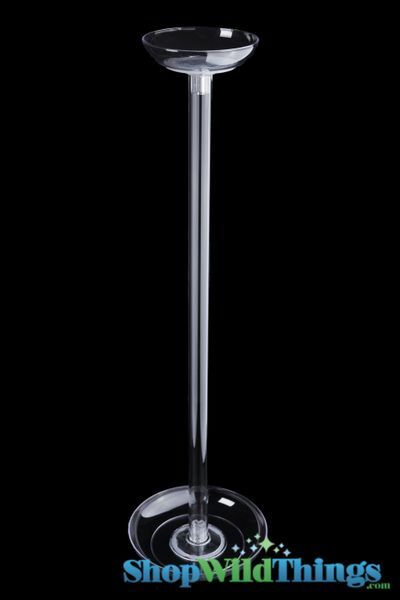 The Lomey Column is also perfect for use with our Acolyte LED Floralytes! You can hang Floralytes inside of the column OR you can remove the strands that they hang from and just place them inside of the base and/or the top. Use the Floralyte 1 Time Use, or FloralyteII which can be turned on and off. This is a wonderful way to illuminate these wonderful columns! 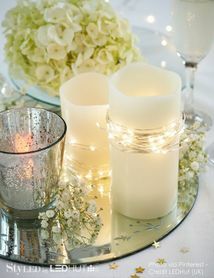 You can even add the Jelly Decor AND Floralytes for a SPECTACULAR look! On the top OR on the bottom you may also consider using our LED Illuminators. 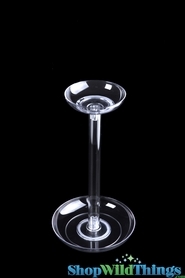 They are super bright LED Lights on a saucer that will light up your entire display magnificently. These columns are also spectacular for creating tall Balloon Centerpieces! Column Diameter is 1". Universal Piece Diameter is 3 5/8". The Lomey dishes are 6" (top) and 9" (base). The ShopWildThings.com price on these INCLUDES 2 Universal Pieces, Top and Base dishes, which you normally have to buy separately! The Lomey Adhesive is sold separately. 1. The center columns will come with a 'Universal Piece' which is a small base that has a cross-hatch pattern on it. Place one Universal Piece on the bottom of the column. 2. Fill the center column with Decor of your choice, or leave empty. 3. Place the 2nd Universal Piece on top of the column. 4. Glue the bottom Universal Piece to the 9' Lomey Dish. Make sure you place the glue all the way around the raised flip of the Universal Piece. We carry Lomey Adhesive, which is perfect for this material, or you can use your own glue. 5. Glue the top Universal Piece to the 6' Lomey Dish . Make sure you place the glue all the way around the raised flip of the Universal Piece. We carry Lomey Adhesive, which is perfect for this material, or you can use your own glue. 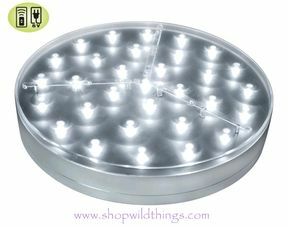 If you plan to use an LED Saucer, place it in the top bowl now. 6. Place your chandelier frame on top of the 6' Lomey Dish and the LED Light. You can secure the chandelier frame with tape or with our U Glu Adhesive Dashes or other tape to keep it from slipping off of the top piece. Very easy to set up. I used this to make wedding floral centerpiece for a wedding and extremely happy with the purchase. ProsVery easy to set up and can be used for many tall decorations. ConsSince the bottom bowl is not heavy, it will topple unless you put something heavy in the dish to hold it up. 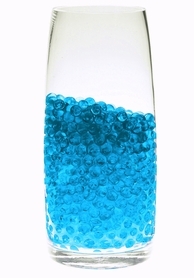 We filled this with purple and clear water beads and used the LED light saucer to light it up from the top. It was gorgeous. ConsCouldn't get the lomey glue to stick to the dishes and had to drain the water out of the riser to keep it from leaking.